One year after the devastating earthquake that hit Haiti, InterAction has teamed up with the U.S. Chamber of Commerce’s Business Civic Leadership Center and FedEx to launch the Haiti Aid Map, an interactive visual mapping platform of individual aid projects being conducted in Haiti. The goals of the map are to increase aid transparency, facilitate partnerships, and help NGOs and others better coordinate and allocate resources to aid relief and reconstruction efforts. With an estimated 10,000 NGOs operating on the ground – the second largest per capita in the world – Haiti has been referred to as “a republic of NGOs.” The Haiti Aid Map is an effort to help the humanitarian community – which has been criticized for lack of accountability, poor transparency, and corruption – better coordinate its response. The map features 479 projects being operated all over the country by 77 local and international NGOs, most of which are InterAction members. Projects can be browsed by location, sector, or organization and include information on project donors, budgets, timelines, and the number of people reached by the project. 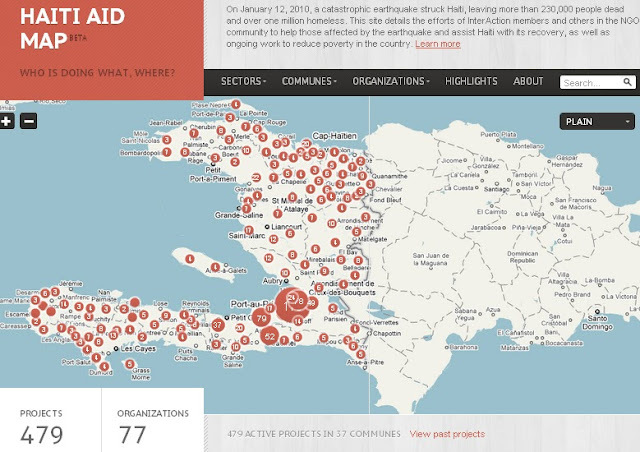 While InterAction’s map covers their donors’ response, it leaves out the thousands of government and other NGO projects being conducted in Haiti. 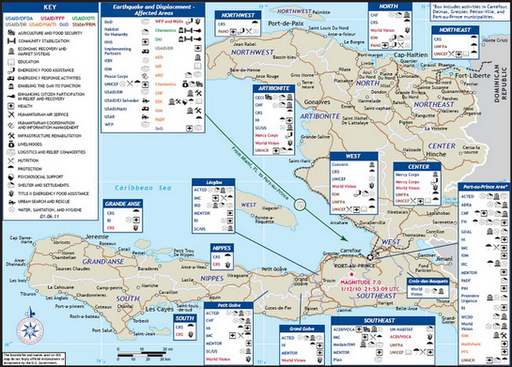 USAID recently released a map of U.S. government projects in Haiti (see right) by sector and location. “The goal is not to rebuild Haiti but to build a different Haiti,” said Sam Worthington, President and CEO of InterAction, speaking exactly one year after the earthquake struck at the map’s formal launch this month. “The relief effort will still be here a year from now.” The goal of the map will be to help coordinate activities as reconstruction continues in the future. The map is the first part of a larger mapping platform, called the NGO Aid Map, which will include not only the Haiti aid map but also projects working on food security in other developing countries. The food security map is due to be launched in March 2011. Sources: Clinton Foundation, InterAction, NPR, ReliefWeb, USIP. Image Credit: Adapted from Haiti Aid Map. I take it the map covers only foreign NGOs? Makes me think that perhaps the only real solution to Haiti's problems lies with empowering domestic grassroots groups — which would require a fundamental change away from "the international aid community knows best" approach. According to InterAction, the map actually covers organizations operating in Haiti with local partners as well, not just foreign NGOs, although it is unclear how common that is.